Trees can be many things: objects, symbols, art, or information. As objects, they act as homes and shelter, they provide food and oxygen, and they bind soil to hold topography in place. They even provide somewhere to sit while you are waiting to discover gravity. Their most famous use as symbols is the Tree of Life, which recurs in many cultures throughout the world. This was later extended to the Tree of Knowledge, a potent intellectual symbol throughout Western history. In the modern world this latter use has been expanded, so that trees are mathematical representations of the relationships among information. Trees have also long played a role in art, which continues in the modern works of, for example, Vincent van Gogh and Gustav Klimt. My first introduction to this was the book The Tree (1979, Aurum Press, UK / Little, Brown and Co, USA) by John Fowles (text) and Frank Horvat (photographs). This is a meditation on the connection between the natural world and human creativity. 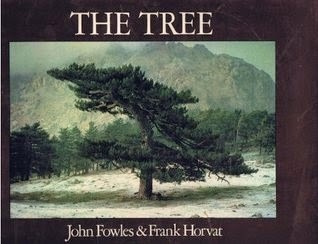 Horvat provides moody views of trees with (almost) no human objects in sight, and Fowles (the novelist) provides a provocative essay on trees as representations of art, revealing in his usual erudite manner that he particularly dislikes the "taming the wild" aspects of horticulture and science. The Gond people have previously decorated their house walls and floors with traditional tattoos and motifs; and these motifs have made their way onto paper as modern representations of the tribal art form. 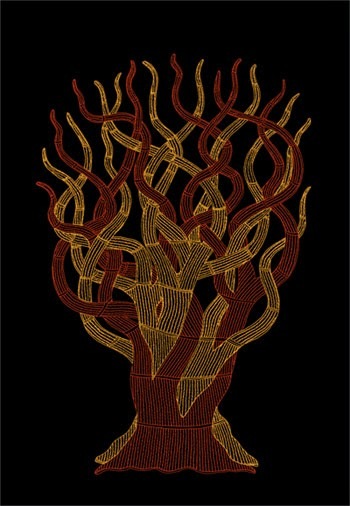 Other tribal art forms that have followed a similar transfomation include the Aboriginal art of Australia, which bears a strong stylistic resemblance to some of the Gond art. The Gonds are traditionally forest dwellers, and so the lives of humans and trees have been seen as closely entwined. Their lore suggests that trees are hard at work during the day providing shelter and nourishment, but at night they finally rest and their spirits are revealed. It is these spirits that the artists have tried to capture in their book. I have reproduced two of the images here, because it is clear that the inter-twining reveals a very network-like aspect of the trees. The accompanying text is taken from the book. The earth is held in the coils of the snake goddess. And the roots of trees coil around the earth too, holding it in place. If you want to depict the earth, you can show it in the form of a snake. It is the same thing. Mahalain trees are found deep inside the thickest jungles, holding each other in a tight embrace. Because it clings and binds so well, Mahalain bark is known for its strength. Our ancestors from earliest times searched for it in the deep jungles and used it to build houses. A house built well with Mahalain bark is said to last a hundred years. Both books are worth seeking out if you value art as well as science. 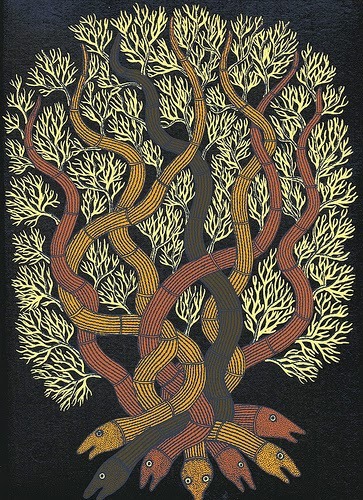 The Gond book is now in its 9th hardback edition, and is widely available in bookstores. The Fowles book (without the photographs) is currently available as a 30th anniversary paperback edition; but you are better off finding a second-hand hardback with the pictures. 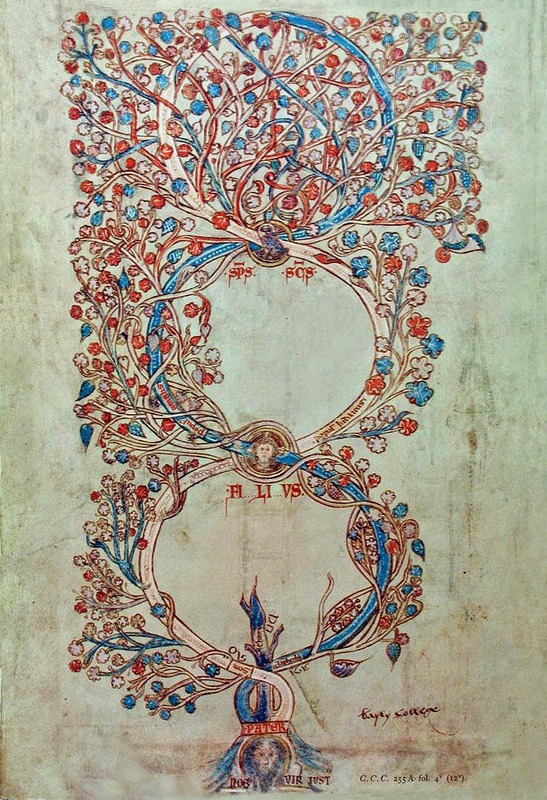 Finally, just by way of contrast, here is the Albero Trinità from Joachim of Fiore's Liber Figurarum (published in 1202), a book that uses many different visualizations to display human knowledge. My daughter was the inspiration for writing this blog post.